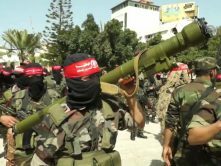 Arab violence against Jews is often alleged to have begun with the establishment of the State of Israel in 1948 or as a result of Israel’s capture in 1967 of territories occupied by Jordan. But even before the Mandate for Palestine was assigned to Great Britain by the Allies at the San Remo Conference (April 1920) and endorsed by the League of Nations (July 1922), Palestinian Arabs were carrying out organized attacks against Jewish communities in Palestine. Systematic violence began in early 1920 with murderous assaults by groups of local Arabs against settlements in the north and by Muslim pilgrims against Jerusalem’s Jews. 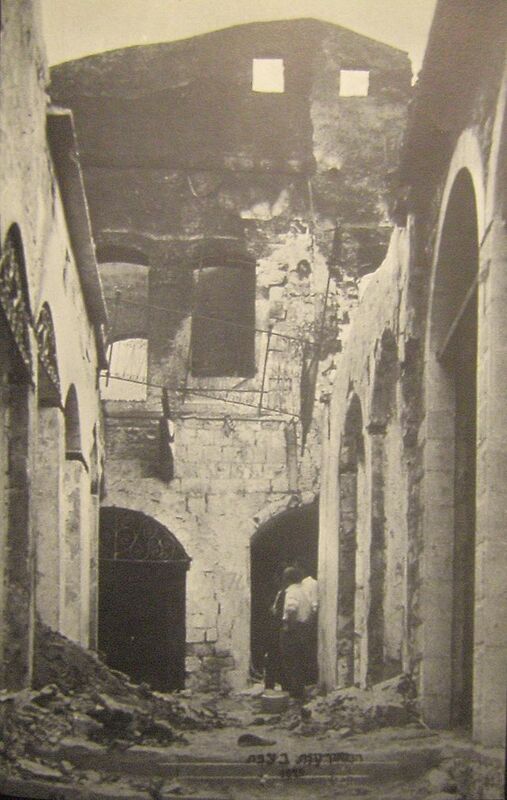 Again in 1921, Arab rioters attacked Jews in Jaffa and its environs. The primary agitator behind these attacks was Haj Amin al Husseini, who marshalled Arab discontent over Jewish immigration into violent riots. In 1929, Husseini and his associates fomented a violent jihad as they called upon Muslims to “defend” their holy places from the Jews. As a result, pogroms were carried out across Palestine. Arab villagers sympathetic to Jews were often targets of murderous attacks by their Arab brethren as well. British forces were sharply criticized for not policing the territory adequately, for sympathizing with the Arabs, and for standing by and allowing havoc to be wreaked upon Jewish communities in Palestine. 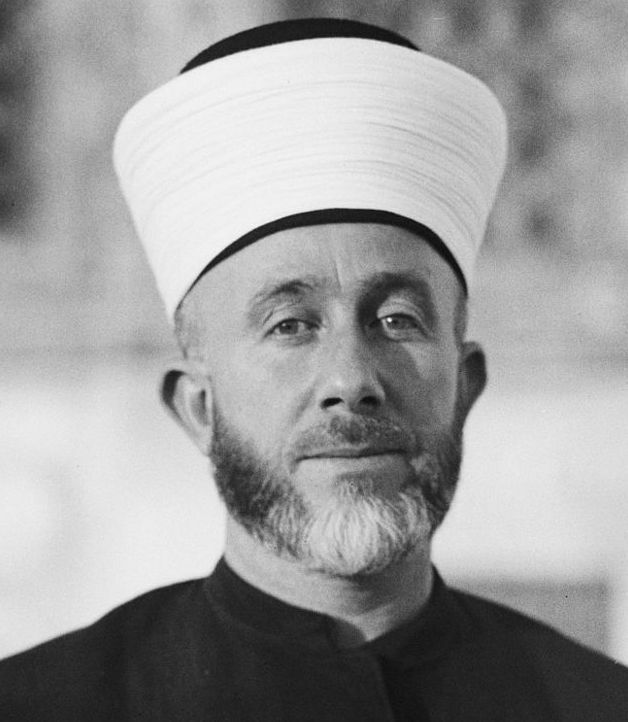 In 1936, the Arab Higher Committee, led by Grand Mufti Husseini, launched a campaign of anti-Jewish violence across Palestine. Accompanied by a six-month-long strike, the campaign became known as “The Arab Revolt.” As the British increasingly became targets of Arab violence, they used massive force to suppress the aggression. The revolt was finally quashed in 1939. 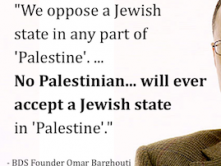 The resulting White Paper of 1939 reversed British commitment to a Jewish State (the raison d’etre of the Mandate) and drastically limited Jewish immigration into Palestine. 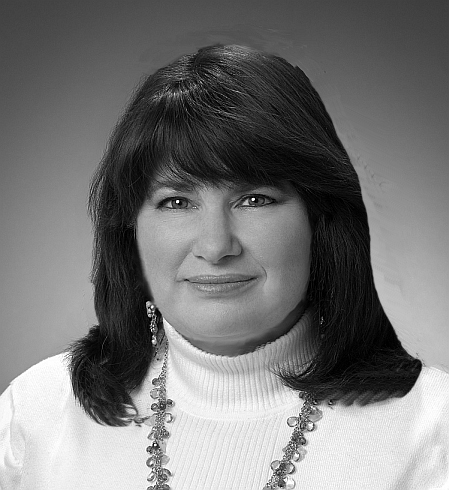 Organized anti-Jewish violence began in earnest at the beginning of 1920. In January, Arab villagers attacked Tel Hai, a Jewish settlement in the Galilee near the Syrian border (then under French control), killing two members. 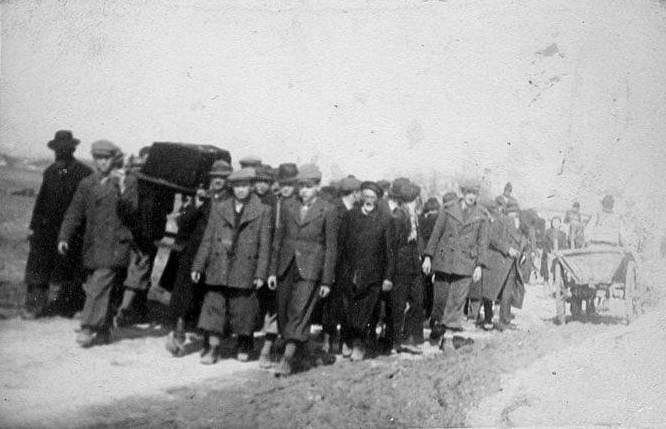 Two months later, on March 1, 1920, hundreds of Arabs from a nearby village descended on Tel Hai again, killing six more Jews. 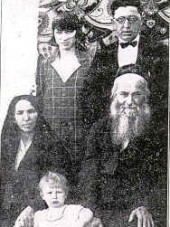 Among them was Josef Trumpeldor — a Russian wartime hero who had fought in the Russo-Japanese war and who organized the defense of the settlements in the Galilee. 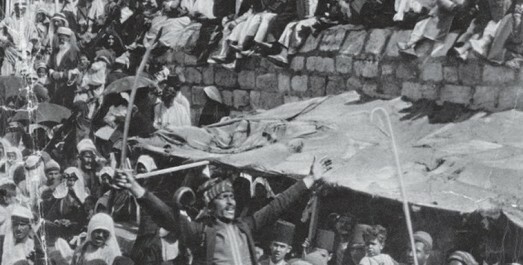 Around the same time, during the Passover and Easter holidays, a group of Palestinian Arab “Nebi Musa” pilgrims (making their annual pilgrimage from Jerusalem to the site they believed was Moses’ tomb), were incited by Haj Amin al Husseini’s anti-Jewish rhetoric to ransack the Jewish Quarter of the Old City of Jerusalem and launch violent anti-Jewish riots. 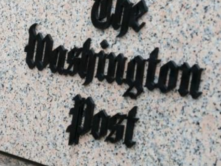 The violence, which took place between April 4 and April 7, claimed the lives of nine people — five Jews and four Arabs — and left 244 wounded, the vast majority Jews. The British military administration, sympathetic to the Arabs, did not allow the Jews to arm themselves. Ze’ev (Vladimir ) Jabotinsky, a Russian journalist and Zionist activist, organized the defense of the Old City Jews with demobilized soldiers from the Jewish Legion who had participated in the British military campaign against the Ottomans. (Jabotinsky and Trumpeldor had organized and helped lead the Jewish volunteer military units that had fought with the British.) When the British authorities finally quelled the riots, Jabotinsky and 19 associates were arrested for possession of illegal weapons. 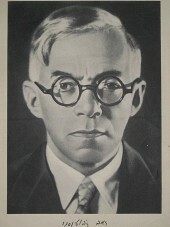 Jabotinsky was stripped of his commission in Palestine, and was sentenced to 15 years of penal servitude. The Arab aggressors, by contrast, received much lighter sentences. Worldwide protests, however, forced the British to shorten and eventually revoke the sentences of Jabotinsky and his associates (as well as the incarcerated Arabs). A commission of inquiry, led by Sir Thomas Haycraft, Chief Justice of the Supreme Court in Palestine, was set up to investigate the causes and circumstances of the riots and concluded that the violence was due to Arab resentment of Jewish immigrants to Palestine. As a result, the British High Commissioner, Sir Herbert Samuel, ordered a temporary halt to Jewish immigration. Ships carrying Jews were not allowed to land in Palestine. In November 1921, another Arab attack on the Jewish quarter of the Old City was repelled by the Haganah, Jewish defense volunteers. 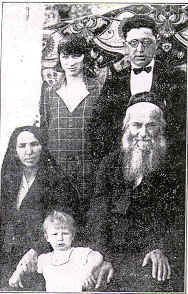 Between 1918 and 1928, the Jewish population in Palestine doubled, to about 150,000. Palestinian Arabs were concerned about this and their leaders, with Haj Amin al Husseini at the forefront, fanned the flames of hatred and suspicion. Husseini, now the Grand Mufti of Jerusalem, used the Western (Wailing) Wall — the last remnant of the Jewish Holy Temple compound — as a focal point for his anti-Zionist campaign. 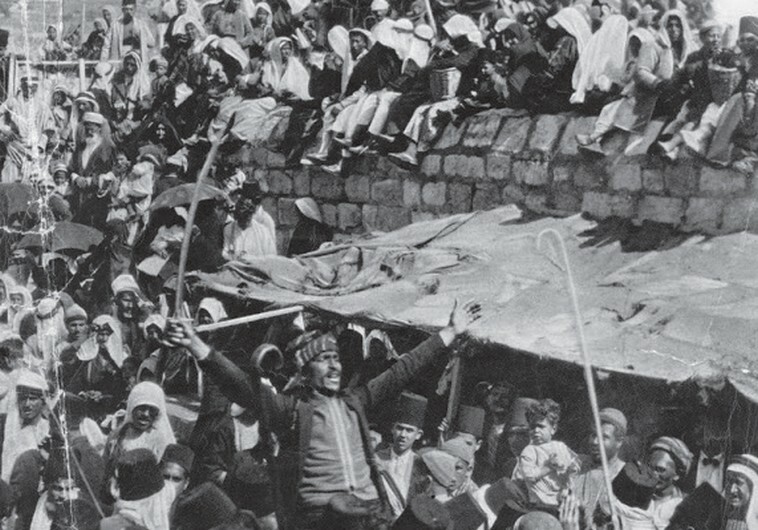 In September 1928, a small group of Jews erected a “mechitza” (a divider to separate men and women during prayers) for Yom Kippur prayers at the Western Wall. The British forcibly dismantled the divider, but Husseini used this incident as a pretext to incite Muslims. 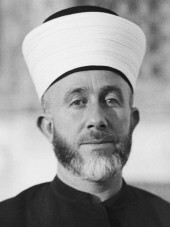 He accused the Jews of attempting to seize Muslim holy sites, including the al Aqsa Mosque. A virulent propaganda campaign calling for jihad against the Jews resulted in the frequent beating and stoning of Jews worshipping at the Wall and culminated in widespread, murderous riots across Palestine in August 1929. August 15, 1929 was Tisha B’Av, the day on which Jews commemorate the destruction of the Holy Temple. Thousands of Jews marched to the Wall to protest British restrictions on Jewish prayer there, and to reaffirm their Jewish connection to the holy site. 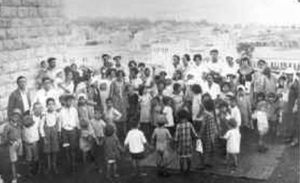 They displayed their nationalistic fervor by singing Hatikvah (later to become Israel’s national anthem). 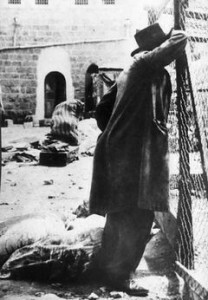 The following day, mobs of armed Arab worshippers inflamed by anti-Jewish sermons, fell upon Jewish worshippers at the Wall, destroying Jewish prayer books and notes placed between the stones of the wall. On August 17, a Jewish boy was killed by Arabs during ensuing riots in the Jerusalem neighborhood of Bukharan. 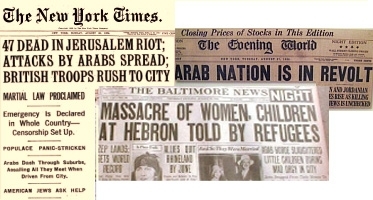 According to the Davar newspaper of August 20, 1929, incitement against the Jews was rampant, especially in the Jerusalem and Hebron area. 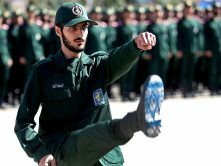 Rumors were spread that Jews had cursed Islam and intended to take over their holy places; Muslims were told that it was their duty to take revenge. 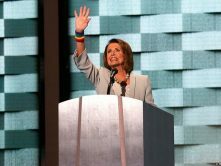 “Defend the Holy Places” became the battle cry. 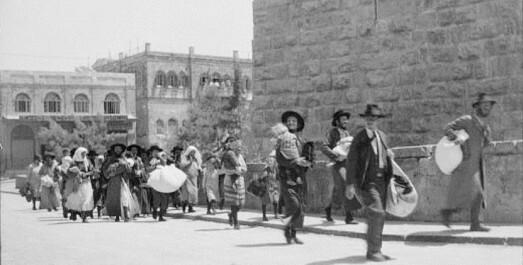 Jews fleeing Arab riots in Jerusalem’s Old City, 1929. 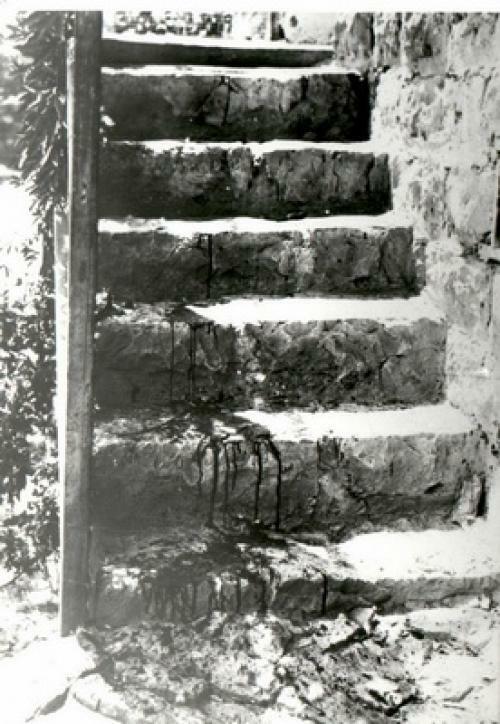 On August 23, more than 1000 Arabs launched attacks on Jews throughout Jerusalem. 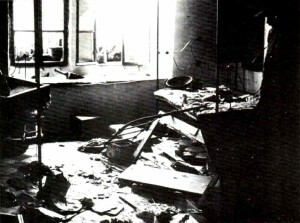 Forty-seven people were killed. This was followed by widespread attacks on Jews throughout Palestine. Again, the British forbade Jews to organize armed self-defense units and within several days, 133 Jews had been killed and 339 wounded. Arab attackers sustained high numbers of casualties (116), almost all of whom were killed by British police trying to quell the violence. 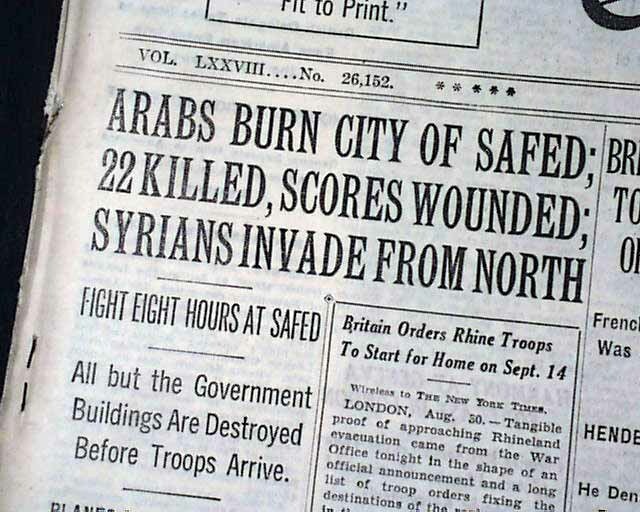 Jewish leaders reported that Arab attacks showed evidence of organized warfare; Arab assaults on Jewish communities extended from as far south as Hebron to Haifa, Safed, Mahanaim and Pekiin in the north. A state of emergency was declared and martial law was imposed by the British. According to Dutch-Canadian journalist Pierre Van Passen who was in Palestine at the time, fabricated pictures of Muslim holy sites in ruins were handed out to Hebron Arabs as they were leaving their mosques on Friday, August 23, 1929. The captions on the pictures claimed that the Dome of the Rock was bombed by the Zionists. That evening, armed Arabs broke into the Yeshiva (Talmudic academy) and murdered the lone student they found. 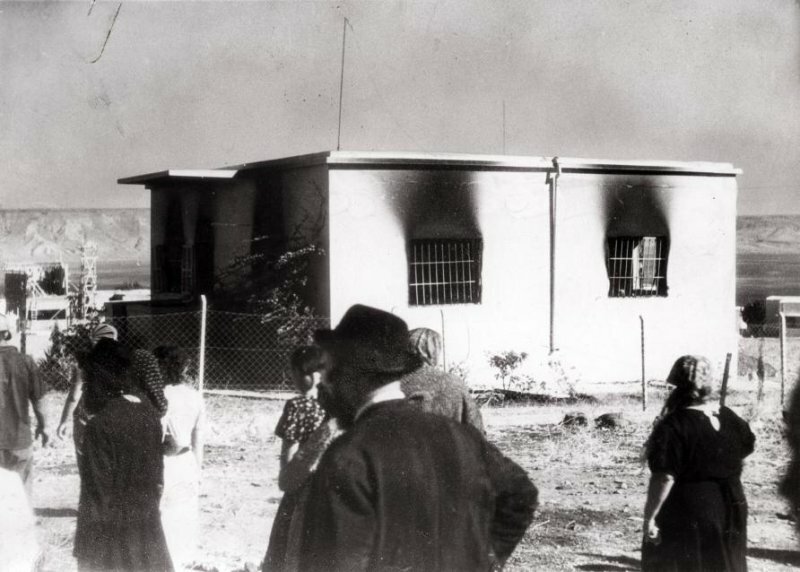 The following day, an enraged Arab mob wielding knives, axes, and iron bars destroyed the Yeshiva and slaughtered the rest of the students there. 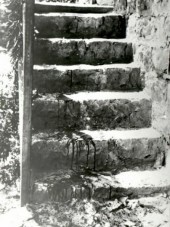 A delegation of Jewish residents on their way to the police station was lynched by an Arab mob. The mob then proceeded to massacre Hebron’s Jews — both Sephardi and Ashkenazi — who had lived peacefully with their Arab neighbors for years. 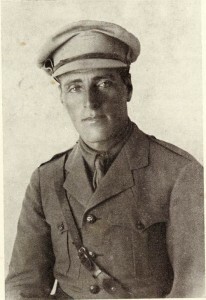 With only one British officer supervising, the Arab police made no attempt to prevent the massacre. 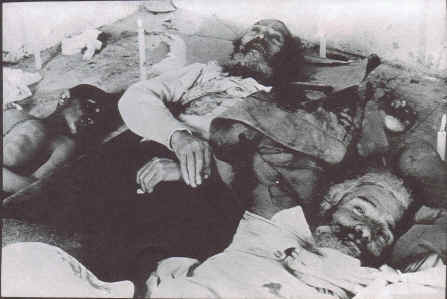 In total, sixty-seven Jews were killed and 60 were wounded. The Jewish community in Hebron was destroyed. 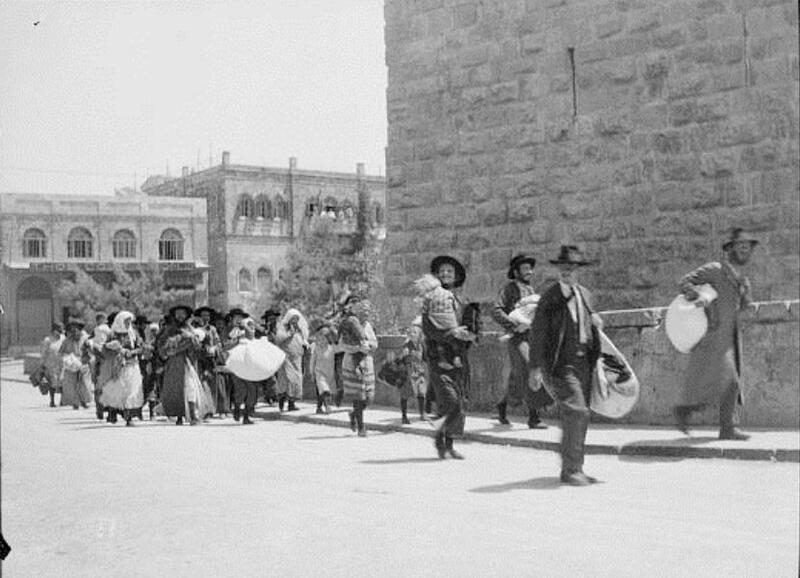 In 1931, the community attempted to rebuild, but during the riots of 1936, the British authorities evacuated Hebron’s Jewish residents and did not allow them to return to their homes. Hebron, one of the four cities holy to Jews, which, for many centuries, had a Jewish presence, remained Judenrein for over 30 years. It was only in 1968, after Hebron came under Israel’s control, that Jews resettled there. Barely a week after the Hebron massacre, Safed, another one of the four Jewish holy cities, was subject to the same depredations. 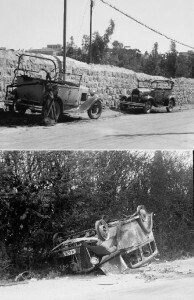 On August 29, 1929, Arabs from Safed and nearby villages assaulted and murdered their Jewish neighbors, burning and pillaging their homes. Witnesses called it a pogrom. Eighteen Jews were killed, 40 wounded, and 200 houses were burned and looted. The local Jews gave me a detailed description of how the tragedy had started. The pogrom began on the afternoon of Thursday, August 29, and was carried out by Arabs from Safed and from the nearby villages, armed with weapons and tins of kerosene. 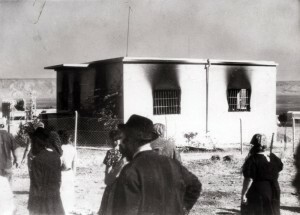 Advancing on the street of the Sefardi Jews from Kfar Meron and Ein Zeitim, they looted and set fire to houses, urging each other on to continue with the killing. They slaughtered the schoolteacher, Aphriat, together with his wife and mother, and cut the lawyer, Toledano, to pieces with their knives. 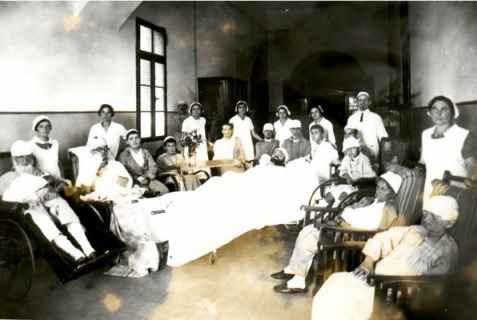 Bursting into the orphanages, they smashed the children’s heads and cut off their hands. I myself saw the victims. Yitshak Mammon, a native of Safed who lived with an Arab family, was murdered with indescribable brutality: he was stabbed again and again, until his body became a bloody sieve, and then he was trampled to death. Throughout the whole pogrom the police did not fire a single shot. Toward the end of 1935 and the beginning of 1936, Arab demonstrations were held against Jewish immigration and purchase of land in Palestine. Tensions between the Arab and Jewish population grew. On April 15, 1936, Arabs attacked Jewish vehicles on the highway and murdered three Jews. The following night, two Arabs were shot by unidentified masked gunmen, in what the Arab community believed to be a reprisal attack by Jews. The gunmen were not identified, but soon false rumors were spread that Jews had murdered Arabs in the Jaffa area, upon which a Jewish bus was attacked and local Jews were assaulted. Within days, Arab mobs were assaulting and murdering random Jews and destroying Jewish property. April 15, 1936: 3 Jews in Tulkarm killed by Arabs. 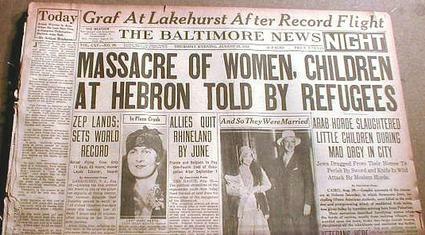 May 16: 3 Jews in Jerusalem exiting a cinema are shot dead by Arabs. 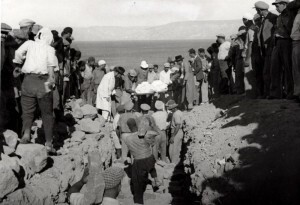 From May 30 – June 13, 1936, in more than 11 attacks, the Arabs destroy over 30,000 trees planted by Jews, as well as many fruit orchards,crops and barns. Telephone wires are cut throughout the district, roads are barricaded, and bridges and culverts are mined. Volunteers from Syria and Iraq aid the Arabs in their attacks. Not since the riots of 1929, when Arabs fell on Jewish men, most of whom were rabbinical students, as well as women and children, in the ancient towns of Hebron and Safed, has there been in Palestine such a slaughter as the attack of last night. The main synagogue of the town was destroyed by fire, and the district offices, the police station and the British police billet were fired on. 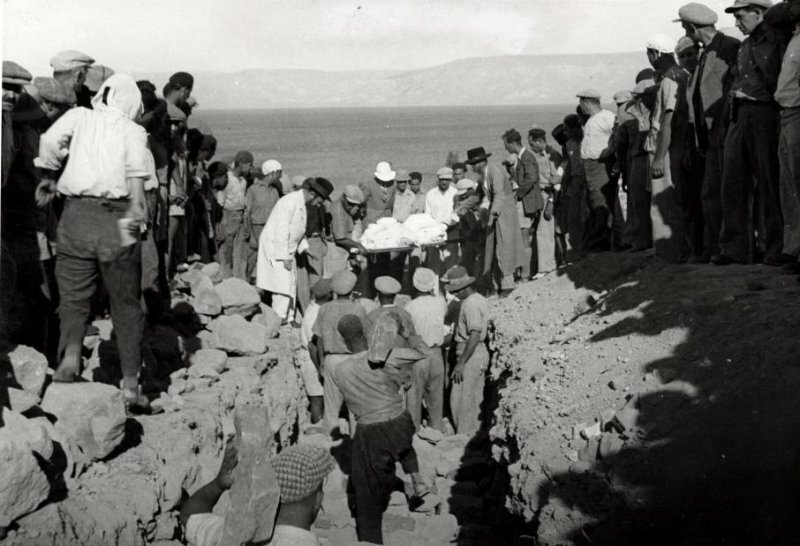 The three-year campaign of violence was finally suppressed in 1939, after which a British White Paper limited Jewish immigration into Palestine. As a result, many of the Jews fleeing Nazi Germany were denied a haven from destruction.